Brand new for 2018 and packed with performance, comfort and style comes the Rollerblade Twister Edge X Urban Skates. The Twister Edge X has a molded shell design for a snug and responsive fit that is adjustable thanks to the ratcheting buckles at the cuff and midstrap. There is a Premium Specialized liner that is contoured to give you ideal comfort and an instant heel lock for a comfortable and secure fit. The Twister Edge X was built for the streets so they are highly durable and there is an integrated Shock absorber in the heel that will reduce vibration from the road. There are 80mm wheels with an 85A durometer that will give you a touch of speed as you maneuver the streets. Great Upgrade from First Inline Skate. 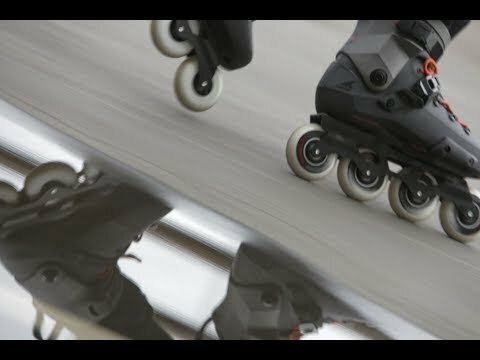 I had done hours, days of research on what inline skates I wanted to purchase after having used Rollerblade Zetrablades for about a year. I knew I wanted an Urban skate, a boot that fit tighter on my feet, and a skate that could be customized to use a 3-wheel configuration if I wanted that in the future. First I found the Rollerblade 80s and thought they would be a good pair to start on, but I realized I'd probably want to upgrade parts of those skates early on. 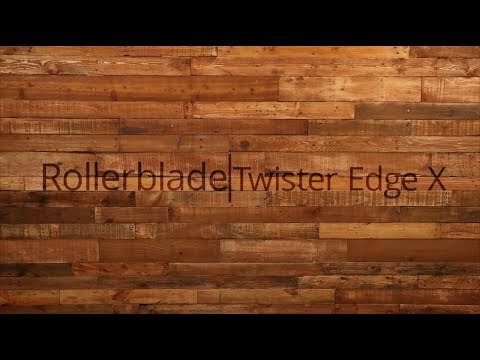 I settled with the premium Twister Edge X Urban skates from Rollerblade because of the reviews on this website and the many youtube videos of urban skaters that have used the skates. After reading several reviews and doing a lot of research I measured my foot to be 11.5" and purchased a size 12. Sadly, inlineskate.com said the skates wouldn't ship for 1 month due to not having them in stock. But I had these skates less than two weeks later! Either the website was incorrect, or inlineskate.com pulled some strings with Rollerblade and got these babies to me FAST. At first, the size 12 was so snug and tight, I feared I had purchased a half size too small. I wore the skates after I came home from work until I went to bed for a few days and after a few hours skating in them, I found size 12 was PERFECT for me. The MyFit liner is amazing and formed to my foot. I've had these skates for three months and am way more confident in them than my old Zetrablades. And although they are hard boot skates, I've not really had any blister or soreness issues. Last but not least, the ILQ9 bearings and Hydrogen wheels will keep you rolling effortlessly! 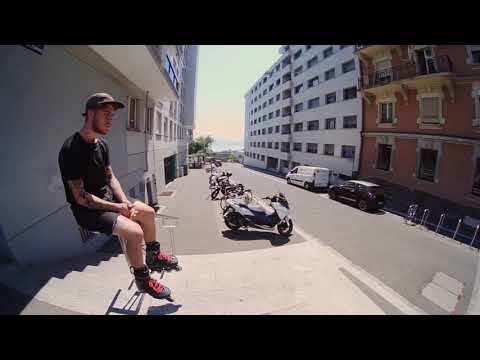 Rollerblade Twister Edge X Urban Inline Skates. Q: Will you have these ones in 9 soon? A: As the new 2019 skates roll in this has become a past season skate and we will more than likely not receive any additional sizes in stock than what we currently have on hand. Q: Are these serviceable bearings in these skates? A: Yes, these have the ILQ9 bearings which are serviceable bearings. Q: Hi, if I wear 8.5 U.S. shoe, should I order my skates in 9 for the Edge X? My feet are exactly 26.5cm. Thank yoy very much! A: If you view the size chart you will see that Rollerblade recommends skaters go a full size up on the Twister models but it really depends on your personal preference in fit. If you want a tight performance fit the half size bigger may work well but if you want a more laid back fit the full size up would work well. Q: Could I fit wheels smaller than 80mm to this skate? A: Max wheel size is 80mm but you could go down in size if you were looking to do so. Q: How would you compare this to the Metroblade GM? A: They are similar skates in the wheels, bearings, frame but are very different boots. The Metroblade has a carbon sole which will offer a very stiff feel and great performance, with a softer style boot and Velcro closures. The Twister Edge X has a standard plastic boot and ratchet style straps. It really comes down to preference in your desired fit and feel. Q: Is this sizing for women? Is there a version if this skates for women at all? I want this, I want hydrogen wheels. A: There is not a Twister Edge X women's currently but there is a women's version of the Twister Edge. The women's version comes with the supreme wheels not the hydrogen but you could always upgrade at a later time when it comes time to replace the wheels. The women's version will offer a slightly narrower fit with a slightly lower cuff to accommodate a woman's lower calf muscle. If you wanted to go with the men's Twister Edge X you could drop a full size for a proper fit, and could even add a heel lift to accommodate for the higher cuff. Q: My feet is 25cm.. for all twister and RB model, should I go with size 39 or 40 ? And can I change the wheel size ? If I cannot change the wheel size, can I change the frame? Do you ship to Indonesia? A: Max wheel size is 80mm on the Twister Edge X but you can change the frame. The frame has 165mm spacing and will take any frame that will fit that spacing. For Edge model skates Rollerblade states you should go a 1/2 size bigger so although in most all other Rollerblade models you would be in the size 39 (7.0 US) in the Twister Edge you would want to go with the 40 (7.5 US) For international checkout please add the items to your cart and choose the international checkout option. Q: According to Rollerblade's official sizing PDF for its Maxxum and Twister line of skates it's recommended to wear a full size larger than my regular foot size; my feet are a size 9. Does this mean I would wear size 10's for the Twister Edge X? A: This is really down to personal preference and your desired fit. I have the Maxxums and take them in my standard shoe size. If you've worn performance fitting skates or ski boots in the past then you should have no issue with these skates taken in your actual shoe size. I believe many take these and expect them to fit like a soft sided skate but the fit is much tighter and more performance oriented. Best bet would be to purchase both close sizes and then return the one that doesn't fit if you can wing the added expense. We do offer a guaranteed fit program which makes it easier to return skates if multiples are purchased. For more information please search "guaranteed fit program" in the top site search bar.